The model 325 uses Direct Digital Synthesizer technology to generate high precision waveforms with very low distortions and spurious. All waveforms are internally generated with amplitudes to 10Vp-p into 50 ohms. An offset generator allows the generation of signals with large offsets. A full range of triggering capabilities is available, including internal-external trigger source, and gated and burst modes of operation. A menu-driven front panel operation with an easy-to-read graphic LCD display makes the MODEL 325 easy to operate. Parameter changes can be made and data can be entered using the rotary knob. Instrument settings can be stored in the flash memory of the instrument. Automatic calibration of the unit can be performed in seconds from the front panel, without using expensive instrumentation or calibration services. The wide choice of build-in standard waveforms gives instant access to frequently used test signals. The standard waveforms are: sine, triangle, square, ramp, and pulse. 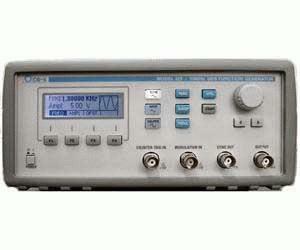 AM and FM modulation are available with programmable internal or external signals. The instrument can be remotely controlled by the built-in RS-232C interfaces. All parameters, modes, and functions are programmable.